a) Getting adequate sleep overnight and waking up with a smile. b) Practicing meditation and deep breathing to invoke and channelize positive sentiments. c) Interacting with enthusiastic and well-meaning people who support your career and aspirations. d) Being mentally agile and physically fit. In conjunction with the above, you would also do well to judiciously analyze the nature of failure. Doing so will remove the trepidation's surrounding failure and even cause you to embrace it. Remember that initial failure is virtually unavoidable in all spheres. 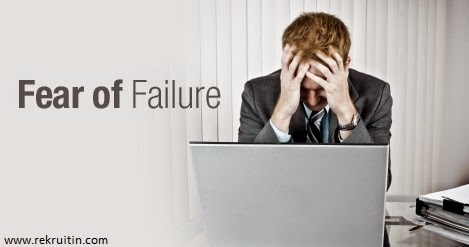 In fact, failure has been the foundation on which many a flourishing career has been built. Hindrances and obstacles are known to galvanize people, strengthen their inner character, and propel them to triumph against all odds.Truly, failure is the stepping stone to success. Such objectives will considerably diminish your concerns and trigger you to energetically accomplish them. Quite often, fear is the outcome of unnecessarily comparing your life with others and not concentrating on your own competencies. You should realize that others have different targets and discrete proficiencies making any comparisons unfair and unwarranted. Therefore an ideal way to disband fear is to focus on your strengths and abilities all the while keeping a lookout for opportunities and threats. This approach will impel you forward with boosted self-belief. A superior technique of dismantling the fear of failure is to keep backup plans ready. By doing this, you will be assured of a fruitful course of action lest the current path goes awry. The security of the underlying alternative plans will go a long way in dispelling your failure apprehensions.